UMI's boxed lower control arms utilize their Roto-Joint technology for a bind free performance and quiet comfortable ride quality. The boxed control arms are fabricated from 0.120 wall thickness rectangular tubing, CNC machined drawn over mandrel bushing holders and MIG welded end caps to keep out unwanted road debris. Each control arm features the correct provisions for adding a stock or aftermarket rear sway bar, sway bar holes are reinforced with a 0.120 wall thickness steel sleeve that is TIG welded and sanded into place. The solid construction combined with the delrin lined Roto-Joints eliminate control arm flex and bushing deflection for improved traction and reduced wheel hop. The installed Roto-Joint is a pivot ball lined with a greaseable delrin race designed to offer 28 degrees of total unrestricted movement, more than adequate for a bind free, low friction operation. The installed delrin race, which lines the spherical ball, absorbs shock and road noise for a quiet and smooth operation on any street or track driven vehicle. This control arm set features polyurethane bushings on one end and UMI's swivel Roto-Joint on the other end. This set-up is designed for street performance and street enthusiast. The polyurethane bushing end is designed to be bolted to the vehicle chassis side while the Roto-Joint attaches to the rear end side. Since the polyurethane bushings are softer they are designed to absorb more road noise and shock before it enters the passenger compartment of the vehicle. All bushing ends and Roto-Joints are greaseable and low maintenance making an excellent street setup for your cruiser! Constructed of 3" x 1-1/2" x 1/8 rectangular steel tubing. Mig and TIG welded construction for superior strength. CNC Machined for accurate tolerances and perfect fit. Energy Suspension greaseable polyurethane bushings. Brilliant and durable powder coat finish. UMI's Roto-Joint, short for Rotational Joint, allows 28 degrees of total rotation and unrestricted movement throughout the vehicles suspension. The Roto-Joint is designed to work like a spherical rod end while maintaining streetable qualities of a softer bushing. The Roto-Joint is designed to articulate and prevent suspension bind, and since the installed delrin race does not deflect like softer bushings, there is an improvement in traction and a significant reduction in wheel hop. The construction of the Roto-Joint features a 4140 chrome moly, hard chrome plated spherical ball which rotates in a delrin race. The 4140 chrome moly material and hard chrome plating are designed for extensive wear resistance against hard driving and accumulated miles. The spherical ball rotates in the CNC machined delrin bushing, which is contoured for the spherical ball to allow unrestricted movement as the ball rotates. Delrin is the bushing material of choice due to its high resistance against wear, great tensile strength, and ability to maintain its physical properties. The housing of the Roto-Joint features 4140 chrome moly threads, and a CNC machined bushing holder TIG welded together for the utmost in strength and durability. The UMI Roto-Joint is adjustable and 100% rebuildable. This means as the delrin race wears the adjuster ring can be tightened using the optional spanner wrench to apply tension to the ball. If the delrin race would ever wear completely it can be replaced easily. UMI Performance proudly designs and manufactures its entire line of products within its facility located in the small town of Philipsburg, Pennsylvania. The facility features CNC machining, both milling and turning CNC's, band sawing, press brake operation, MIG and TIG welding, sand blasting, plasma cutting and powder coating. They offer many different levels of their product. To see our other items from UMI Performance We recommend narrowing the results by entering YOUR Vehicle's Year, Make, and Model in the "Store Search" area on the left. Thank you for shopping at Matts Classic Bowties. 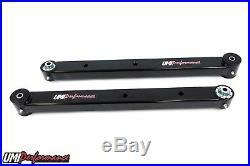 The item "UMI 64-72 Chevelle A-Body Rear Boxed Lower Control Arms Poly Roto Joints Black" is in sale since Monday, October 31, 2016. This item is in the category "eBay Motors\Parts & Accessories\Vintage Car & Truck Parts\Suspension & Steering". The seller is "mattsclassicbowties" and is located in Philipsburg, Pennsylvania. This item can be shipped to United States, Canada.